Just an upstart, up-growing hair. 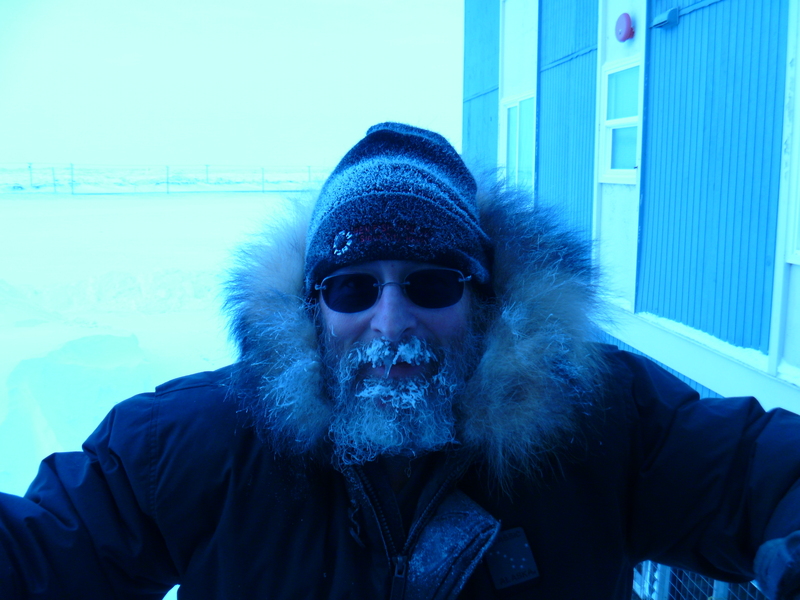 Yesterday ended my clinical tour of duty here in Barrow, Alaska. I pulled the “walk-ins” and I have no complaints. I took my share of Saturday clinics over the years in the Practice Formerly Known As Mine, and I’ve taken my share here. Barrow never got as frantic as home. My shift started at 1:00PM and went to 11:00PM. I slept in, had a leisurely breakfast, napped and read. The sun rose clear and brilliant, late in the morning. I ate my lunch without rushing, and came to work rested and refreshed. I didn’t exactly hurry to the clinic. I didn’t get a call till mid-afternoon, while I was reading in my apartment. Without stepping into the far subzero temperatures or starting a car, I slipped on my shoes and walked leisurely down the hallway into the hospital proper, past the cafeteria, laundry, medical staff office, patient travel, and case management. Patients came in at the rate of two or three an hour as the day waned and the sun slipped behind the southern horizon. With lab and x-ray pending, I got my supper in Styrofoam from the cafeteria. I sat down in medical records, an arm’s reach from the clinic proper, and started in on my Salisbury steak. Bethany called and volunteered to sit with me while I ate. I finished just as results came through. The patients never piled up more than two deep and I got to spend time with each one. People came in with problems in the wake of the influenza, and other respiratory complaints related to current viral infections. One person suffered from strep without complaining of a sore throat. I ordered x-rays for several folks, none of which showed fractures. Two people had constipation. One each had chest pain, foot infection, and urine infection. Too many abused alcohol, tobacco, and/or marijuana. In the evening I had enough time between patients to hang out in the commons and write my post, and I read it out loud to a small audience. I received permission to write this information about the last patient of the evening, who came in with a red eye for a few hours. The fluorescein dye with the Wood’s lamp (popular name: black light) showed no scratch on the cornea. But the magnifiers revealed an errant eyelash on the lower lid growing straight up like a telegraph pole, next to a tiny scar. I could see that every time the patient blinked, the eyelash would jab the upper lid, and probably get poked onto the cornea. I went looking for a forceps, found a really fine pair and plucked the offending hair, with transient pain but immediate relief for the patient. In thirty-three years since I graduated from medical school, I never saw anything like it, the patient is one of a kind. I finished my documentation at one minute before 11:00PM. I walked out of the clinic in the quiet, the dark and cold close by the window, content with the satisfaction of curing the patient. Last night Bethany and I indulged our worst vice: television. We have such a problem with TV that we’ve never owned one. If a television is present, we have no control, and we will watch it to the exclusion of eating, sleeping, and each other. A TV dominates one end of the commons room, and we went there with the intention of serious tube time. Already there we found two lab techs and three nurses. I tuned the large flat screen to the History Channel and found Flying Wild Alaska. The show centers around an Alaska family that runs a small airline, ERA. ERA mostly flies into the bush, those places only accessible by air or boat. They deal with extremes of climate and weather on a regular basis, and make life possible for the fringe of the twenty-first century. The murmur of conversation died away when the narrator said Barrow. Suddenly we all paid attention. Many in Barrow think, “Why would I want to live anywhere else?” A lot of people have left for a decade or two and returned permanently; many others have chosen Barrow as their retirement home. Here cars become more of a hindrance than a necessity, one can feasibly walk most anywhere, streets are safe, cabs are cheap and quick, cab drivers are courteous, young people show elders respect, and world problems seem, well, a world away. Part of the suspense had to do with traction on the runway, and whether or a not a pilot, dangerously low on fuel, would be able to land or not. At the commercial break we broke out into commentary. Sure, we’re weathered in right now, and yes, it’s dangerous being a bush pilot, and no, none of us would want to try to land on a runway with unknown traction. The next Barrow segment had to do with ERA’s new hangar: the first time the door went up, it stuck and could not be lowered. Calls to the manufacturer on the east coast didn’t help; they’d closed for the day. From the footage we inferred they solved the problem with hot-wiring, and we wondered if such a maneuver would void the warranty. This evening, I met an ERA employee (not a patient) who assured me that the door now works well. As I write, the wind howls outside and the building shakes with the gusts. The windows don’t rattle because in a climate as unforgiving as Barrow’s windows have to fit tightly. Last night Bethany and I walked to the store in the long arctic twilight. 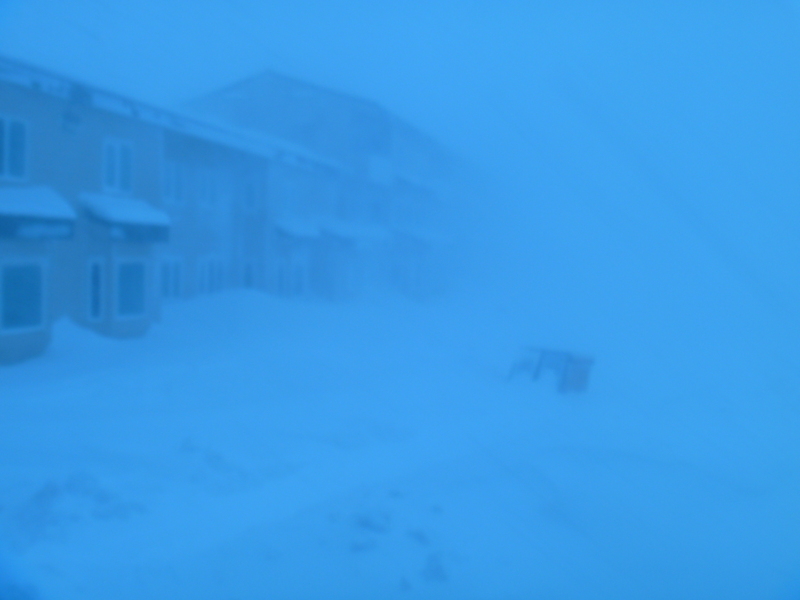 The blizzard had lightened, the wind had let off to 30 mph (50 kph), and the temperature had risen to a record high of 29F (-2C). As soon as we stepped out the door, we felt weird. Six weeks of subzero cold has not kept us inside, we’ve adapted to Arctic winter temperatures with clothing and physiology. The warmer air felt strange on our faces, and the dull crunch under our boots came alien to our ears, accustomed to the squeak of much colder snow. I made a snow ball. When we stepped out of the lee off the building the wind caught us full in the face, and I pulled my hood up. Immediately the rush of air caught inside my hood and flooded the inside of my parka. I welcomed the ventilation because I had started to overheat. By the time we’d crossed the lagoon and turned north the wind came at our backs, pushing us along. We slogged through most drifts, but when we crossed the road by the post office Bethany sank in up to her waist. Further on we turned into the wind but it didn’t sting our faces. Winter, though deep, chilly, and dark, has flown by, and the relative warmth carried the promise of spring. Warmer snow melts quickly and, ironically, cools the face faster than very cold snow. Inside the store, our coats, hats, and mittens filled the grocery cart. We ignored the shocking prices and bought bread, eggs, fruit and dessert. In the checkout line I observed, to Bethany, the contrast between an orchid print of a woman’s parka and the wolf fur on the hood’s ruff. The wind blew full in our faces on the trip home. Darkness closed in, and the dramatic pink and gray of the sky faded into night. Half-way back I took over carrying the pack. Where the gale swept the snow from the levee we trod on ground and ice frozen hard to the consistency of stone. Inside again I observed to Bethany that dry, cold snow doesn’t clump on your boots or cake in your fur ruff like the wet snow of the day, just like the stuff we’re used to at home. You can go out unarmed if you dare. 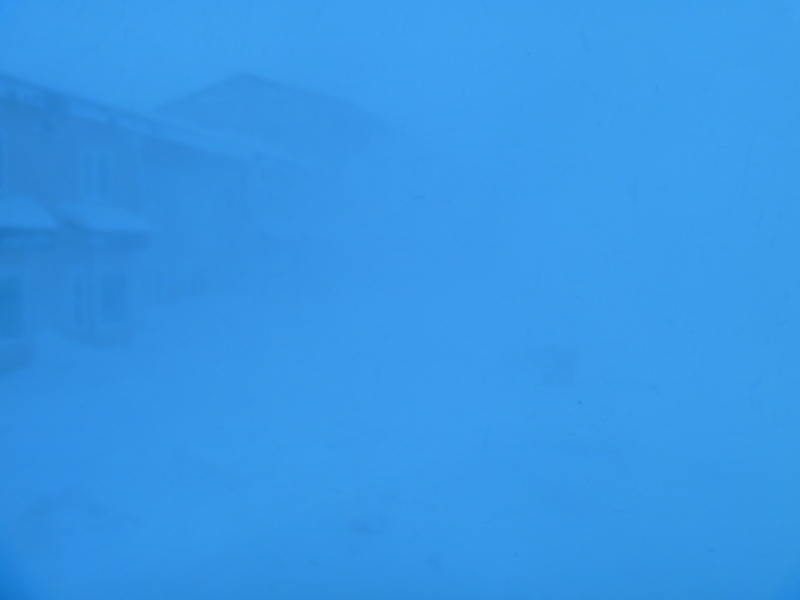 During the blizzard our patient flow fell yesterday. This morning at our daily morning conference, we had few patients to discuss. Not many made it in yesterday, among them a disproportionate number of drug seekers. We talked about that problem at length. Despite our frustration we kept good senses of humor. Two topics generated most of the rest of the conversation, one was the weather with blizzard conditions again forecast starting at noon. We also talked about the polar bears. 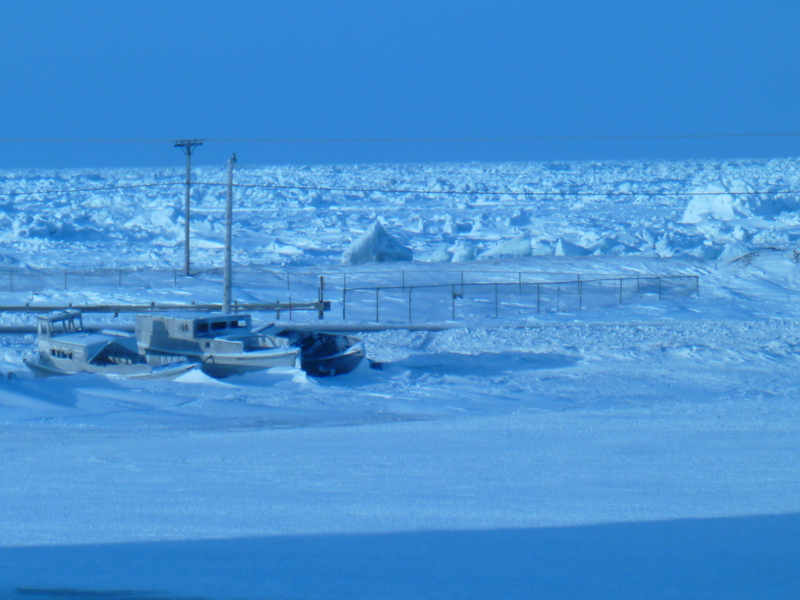 Barrow sits on a peninsula that juts into the Arctic Ocean. With 7500 souls in towns, the bears have an area the size of Wyoming to roam and never see a human. Natives legally hunt and eat bears, and the bears sometimes hunt and eat people. The Barrow Inuit have drawn most of the bears away from town with a designated whale carcass dump site, six miles from any human activity. Still, bears go where they will, and last night three of the white bruins came into town. Bears are a fact of life in Alaska, an undeniable reality. There are many places where getting out of a vehicle unarmed is just plain stupid. Thus, less than twenty-four hours after our arrival, we had a pamphlet slipped under our door. Last night, while Bethany and I sat in the Commons, a nurse called to us from the hallway to come see the polar bear that had been sighted on the lagoon. 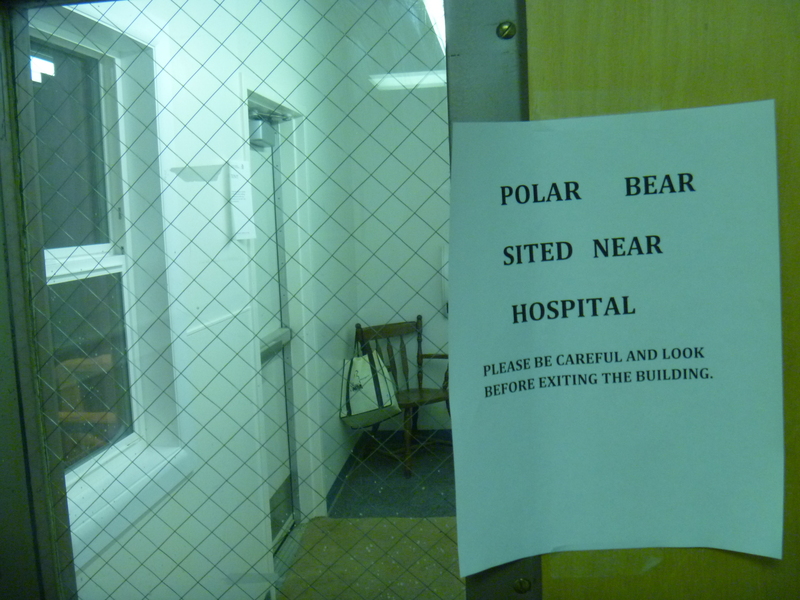 We jogged through the corridors to our apartments, and watched the tail lights of eight snowmobiles and trucks running patterns on the ice outside the hospital housing. The large white carnivores had prowled around the elementary school, we heard, and had last been seen where we were looking. Bethany, who had walked to the elementary school in the dark that morning, and had almost walked back but for the blizzard in the afternoon, said that she was even happier she’d accepted a ride. I learned that the bear police had been called out. The bear police get called out any time a bear is sighted in town. The first one to kill the bear gets to keep it. Snow machines motored, eerily quiet, on the ice in front of the windows we were looking through. 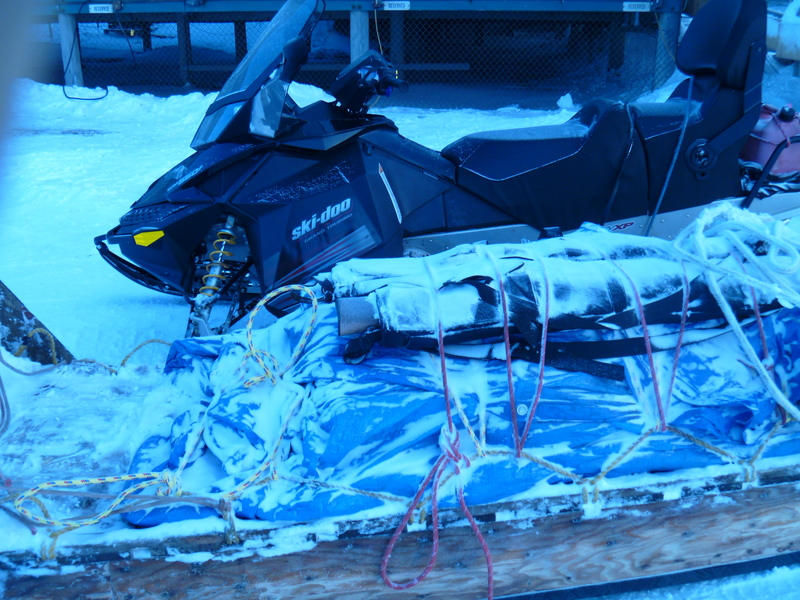 I didn’t see a long gun on the sleds or riders. This morning, we heard three bears had been seen, one by the school, and two on the lagoon. Just read the sign and ignore the spelling. Probably something I’ll never see in Sioux City. When Bethany and I walked to the grocery store this evening, we debated borrowing a firearm for the walk. While outside the arctic wind blows. Long before dawn (the sun rose about ten today), with the mercury firmly at -28 F (-33 C), the physicians of Barrow sat down together in the hospital’s Commons Room. We start clinic days with a conference, an hour discussion of patients who need to be brought to the group’s attention. Sometimes the debate runs hot. No two docs have the same range of skills; we all come away from the discussion better physicians. The hour, for the last week, now features a five-minute starter from the Case Manager, giving us updates on the patients sent to Alaska Native Medical Center (ANMC) for hospitalization. We don’t talk about drama and irony nor contrast and meaning, though we talk about the impact of illness and injury on people’s lives. We focus on diabetes and smoking, emphysema (which we call COPD or chronic obstructive pulmonary disease) and steroids, heart disease and the interplay of factors that bring a person to illness. Occasionally we’ll talk about tragedy and trauma and domestic abuse. Narcotics seeking behavior comes up a lot, but as a group we’ve evolved a way to deal with the problem. Part of the solution includes the doctors communicating with each other. Morning appointments follow morning conference. My last patient before noon survived burning, stabbing, shooting, being run over by a riding lawn mower, and falling from a roof and bouncing (and gave me permission to use more information than I’m including ). After all that trauma, his lifestyle choices threaten his life more than anything else that has happened. I called a specialist in another city, and, in the spirit of full transparency, included the patient in the conversation by leaving the speaker phone on. The specialist said a lot of things he wouldn’t have if he’d known the patient were listening, like using the phrase, “stupid idiot,” but he also gave a good if emotional rundown of the physiology in the case. I watched the patient’s face, he seemed neither offended nor surprised. I respect him as a man of remarkable emotional and physical resilience, whose intelligence has not been ruined by schooling. But I disagree with a lot of his choices. Afternoons, the clinic opens to walk-ins with no appointments necessary or available. Ears, nose, and throat problems dominated the afternoon. One patient left cured after ear wax removal. Four others had ear infections. The mother of a young girl gave her OK to post the following: the child inserted a jelly bean into the nose. Toddlers imitate reflexively though their first response to a command is No. I held one side of the mother’s nose shut, with a tissue guarding my hand, and had her blow through the other nostril. Given the opportunity, the kid did the same thing, and the jelly bean, its colorful sugar coat dissolved, shot onto the paper. I don’t often get the chance to cure patients before they leave. And walked back at thirty below. I’m not used to having legal holidays off. Technically, when I worked for the Indian Health Service, we got tribal holidays. They usually coincided with federal holidays, Columbus Day the notable exception. Still the call schedule had to be filled, and my compensation came in a fixed amount per year, no matter how much I worked. Presidents Day came and I didn’t see it sneaking up. Bethany went to work, and after breakfast, I found no one at morning conference. My name came up on the schedule with the cryptic term Walk-ins, 8 AM to 1 PM. I strolled to the clinic area and chatted with the nurses. I went back to the apartment (remember, the commute runs two minutes at a slow walk), took a nap and read a medical journal. I got calls to come back to the outpatient area for eight patients: three people with coughs, one each with a painful knee, high blood pressure, a cold, back pain, and sore throat. In the process I ate lunch and got off at one. After checking the outdoor temp, I went out for a walk, wandering around town at ten degrees below zero Fahrenheit (about twenty below Celsius). I picked up a cap bill flashlight at the NAPA store, and I took the long way home, turning the stroll into a two-hour hike. After Bethany came home from teaching we suited up for a walk across town to Arctic Thai. I didn’t pay attention to the temp, and I wore the same clothes I’d worn earlier in the day: fleece pants, a long-sleeved t-shirt, parka, hat, and mittens. 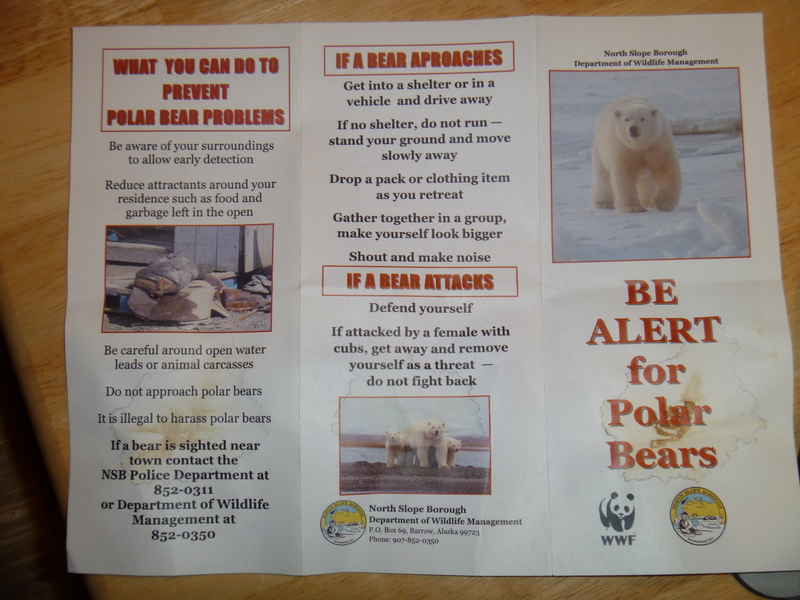 When one says one wants to go out to dinner, one rarely means as far out as Barrow, on the north shore of Alaska’s North Slope, where polar bears come into town on a regular basis. But if you want to go out for really first-class Thai food, and time and distance are not an object, come to Barrow. We ordered Pad Thai; the price was low by Barrow standards but the portion generous even for people who had wandered in from the cold. I do not judge restaurants by the décor or the plates, but by the food and the service. The hot soup that started the meal came free. The Pad Thai was the best I’d had. The cilantro was fresh, the vegetables and chicken stir-fried with a good sear but not overdone. Dessert, custard with sticky rice, didn’t show up on the bill. The wind picked up on the way back, and half-way home I knew my legs had inadequate protection. At that point, crossing a lagoon, we had no choice but to keep going. When we got back I stripped off my cold outerwear. When I checked the net for the temperature I found a thirty-five below wind chill. The food was worth it. Dancing beside the full moon. The weather turned two nights ago, flights got cancelled, and the people who showed in the clinics wore more layers than usual. 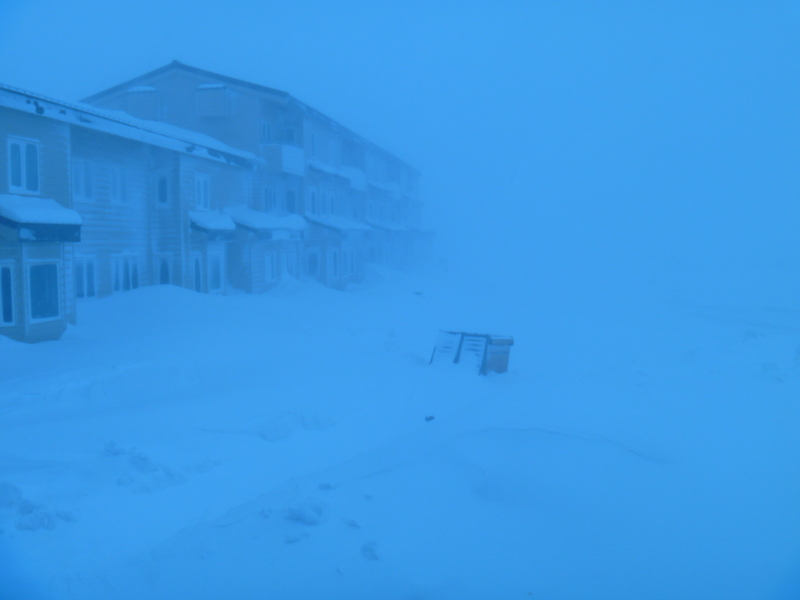 The wind howled off the Arctic Ocean, closing the schools closed at 1:30. Clinic walk-in traffic dropped off. One of the patients who came said she hoped the ice wouldn’t get pushed up over the road. “Does that happen?” I asked. It does. Sometimes the ice goes over the road into the lagoon. She gave me permission to write about the conversation. The Inuit have a word for a piece of ice thrust up onto land by the wind. The patient warned me against walking by the shore in a gale. “Watch out for the ivu,” she said, but the first time she said it I heard ‘evil’. In the midst of the bad weather I heard about a large solar flare, and I anticipated a good show of Northern Lights. 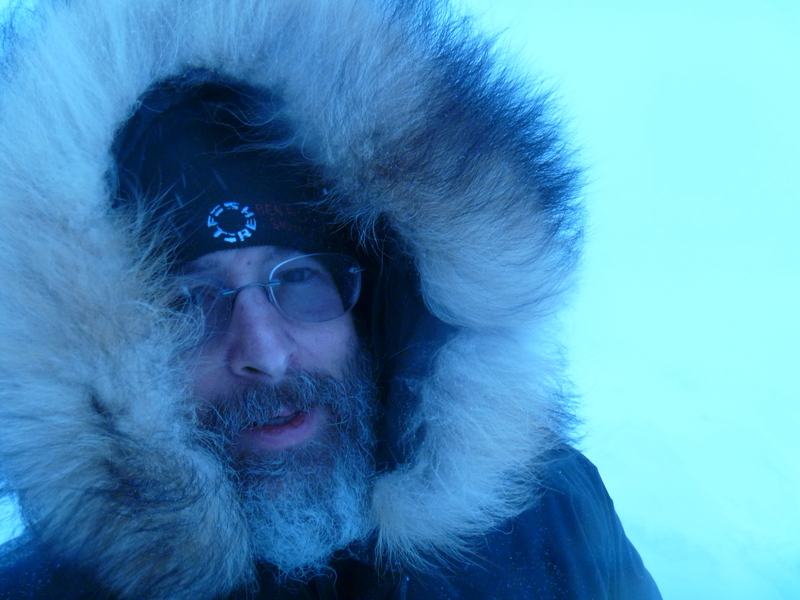 Thus I arose at 5:30 this morning, and suited up for temperatures around minus 30 Fahrenheit (minus 35 Celsius). The full moon hovered off to the southwest, and the Aurora Borealis swept slowly, silently across the sky. I went back inside and woke Bethany, then stepped outside again. We watched the tuneless dance in the heavens till our glasses fogged up, then we went back inside. Bethany had seen Northern Lights as a child at summer camp in Maine; I’d missed them during a short job in Montana. A thing loses its wonder if it is seen every day. I spoke with a person (not a patient) who had left Barrow for the first time in her life, and who gave me permission to recount our conversation here. I asked what she’d thought of Anchorage, and her eyes lit up. Of course I had my expectations about what part of the experience of seeing a modern city for the first time had brought her the most delight, and of course I was wrong. And the first time I went to Anchorage and saw a moose dealing with streets and cars, I couldn’t wait to talk about it either. Such things, common in the largest city in Alaska, loom large in the eyes of outlanders, whether from Iowa or from the North Slope. Substitute teaching in Barrow: Inupiaq and sign but not music. The subs in Barrow? Too few. There might only be one or two. And she gives to her bargain its due. Bethany came with me this trip, bearing good teaching credentials and looking for work as a substitute in the school system. The schools pay the subs well. When no slots exist for teachers, she fills in as an aid and earns more than she would have as a substitute teacher in Sioux City. She’d emailed and called before we arrived. She was well received at the high school and elementary school, but the middle school uses no subs. She taught fifth grade here for a week. Her students remember her favorably, and greet her by name when they see her. Two different Special Education teacher has needed a replacement a couple of times. Bethany in fact has a Master’s in Special Education. The big surprise came when she was tapped to teach the Inupiat language immersion course in the elementary school. “Ok, ok, but that’s not speaking the language,” she said. And she’s right; just because you can say a few words doesn’t mean you speak the language. But Barrow’s twenty-first century language program has computers, and Bethany knows how to turn on a computer. Today she taught sign language to the fourth grade. Her Master’s specialty is Deaf and Hard of Hearing, and she signs well (even if she thinks she’s rusty). She helps me from time to time with my deaf patients, one of them here in Barrow. She helped as much as she could. Unfortunately a language barrier is nothing compared to a sobriety barrier. When the school here called her to substitute teach the music class, she refused. She struggled with the music portion of her Master’s program. For whatever reason, though she sings beautifully, carries a tune and keeps a beat, she failed every time she tried to learn to read music. She approached her music professor at one point and said, “If you let me pass this course, I promise I’ll never take another music course for credit, and I’ll never try to teach music. Look, I’m going to be teaching the deaf.” That professor died while thinking it over, and his successor agreed. Since then she has honored her end of the contract, even when the Sioux City music teachers all attend a conference at the same time, she has no other work and there are no other substitutes. She is a woman of her word. You are currently browsing the Walkaboutdoc's Blog blog archives for February, 2011.